Born Bone Born may be one of the worst ever Western localizations of a Japanese film title. Its pithy alliteration feels designed to be forgettable, custom made for getting lost in the backwash of foreign streaming titles on Netflix or Amazon. The original title is both informative and dignified: Senkotsu, the name for a rural Okinawan funeral practice of bathing a deceased person’s bones one year after burial. It seems unfair that Masato Harada’s recent mediocre war epic was allowed to maintain its original Japanese title of Sekigahara while this tiny gem of a dramedy should be burdened by such an aggressively terrible English title. For this new film by comedian Toshiyuki Teruya is a humanistic cross between the family comedies of Yoji Yamada and the delicate introspective character studies of Hirokazu Kore-eda. 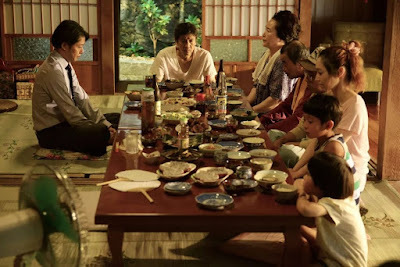 The film follows the Shinjo family living on the Okinawan island of Aguni as they prepare for the senkotsu ritual one year after the death of their matriarch Emiko (Mariko Tsutsui). The proceeding twelve months proved tumultuous ones: her husband Nobutsuna (Eiji Okuda) has fallen into a catatonic alcoholic stupor; her eldest son Tsuyoshi (Michitaka Tsutsui) has gone sour and mean after losing custody of his children in a nasty divorce; her estranged unmarried daughter Yuko (Ayame Misaki) returns from the mainland nine months pregnant with her boss’s baby. The rest of the film watches as the family struggles to reconcile their failings and heal their disparate hurts, particularly when Yuko’s boss unexpectedly shows up at their doorstep looking to make an honest woman out of her. Born Bone Born (ugh) is a warm, relaxing movie as drowsy as a summer’s day at the beach: shots and sequences feel like they end a few seconds after they should, the acting is almost entirely naturalistic and understated, and the cinematography makes the hazy streets and bone-white sand shimmer in the sunlight. Once or twice the film almost veers into intolerable stillness, but never long enough to prove fatal. Takumi Saitoh’s Blank 13 may be the superior film about a family grappling with the death of a parent to premiere at this year’s Japan Cuts, but Teruya’s little triumph shouldn’t be missed by those looking for a breezy, relaxing sit.